This challah cover is part of the Rimon Judaica designer collection. The challah cover is uniquely styled and decorated and will add style to your Shabbat table. 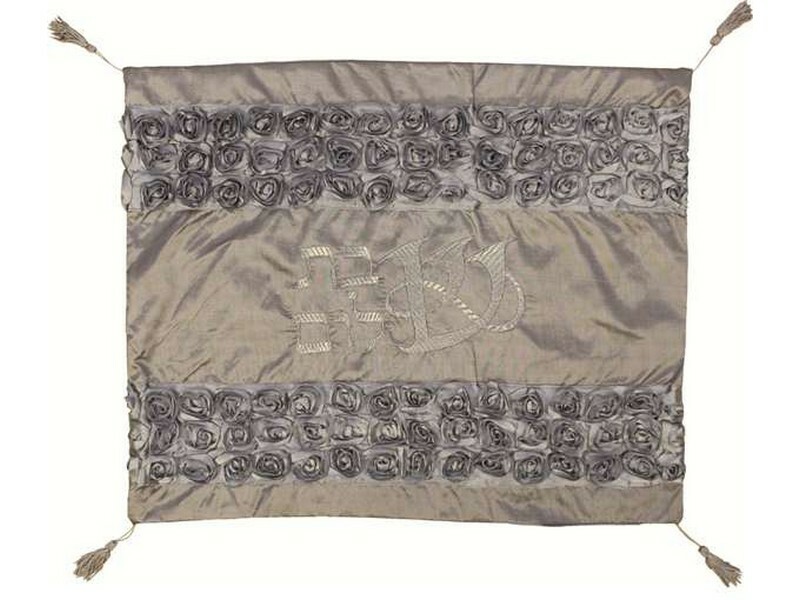 Made from silver colored satin, this shiny challah cover has two sections across of 3D roses. In the center the Hebrew words “Shabbat Shalom”, is masterfully embroider in a pattern-like font. The first letter of both words is the Hebrew letter Shin, which is large and serves as the first letter to both words. There is a decorative tassel attached to each corner. The design is embroidered with gold and silver colored thread on glossy satin cloth. The edges are finished with silver arches. This challah cover includes a plastic protective cover.